Looking at the photos of this bright and spacious kitchen, it is hard to believe it was once a small and boxed space. Envisioned by our designer Ido, the new kitchen was completely transformed to offer a roomy, functional and beautiful space with our client's and pet's needs in mind. From creating a new floor plan combining the kitchen, dining room and living room to replacing the roof, repiping and rewiring to installing new tiles and cabinets, the project took 3 months to be completed. This eco and pet-friendly space features all-white custom shaker cabinets, brushed nickel Bosch appliances, white Caesarstone quartz countertops, a laundry closet and a dedicated area for the pet's food and water with extra storage for all their toys and treats. To give the kitchen a focal point and a pop of color, a custom blue kitchen island was added with an extra sink, a wine cooler, and even more storage space. Click below to check out the before photos of this amazing transformation! A pot filler was added above the Bosch cooktop to make cooking easier. 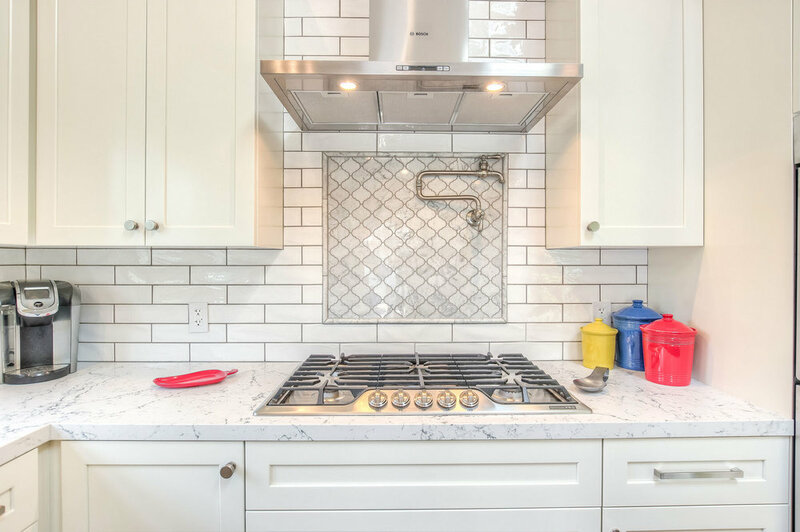 The white shaker cabinets and brushed nickel appliances were paired with a white subway tile backsplash and accent grey arabesque tiles. The bright and colorful kitchen features custom built shaker cabinets, Caesarstone quartz countertops, Bosch appliances and farmhouse style Blanco sink. The kitchen includes a custom built cabinet for the washer and dryer extra storage for all laundry needs. To add a focal point and a pop of color to the all-white bright kitchen we created a custom island in blue with an extra sink, storage space and a wine cooler. The small and boxed kitchen and dining room were combined with an open floor plan and include raised vaulted ceilings and skylights in the kitchen area to create a roomy and airy space. The kitchen was designed with the client's pets in mind to create a covered space for their food and water and extra storage space for their toys, food and treats with their own separate cabinets. Our designer Ido and Shelly, the house owner.